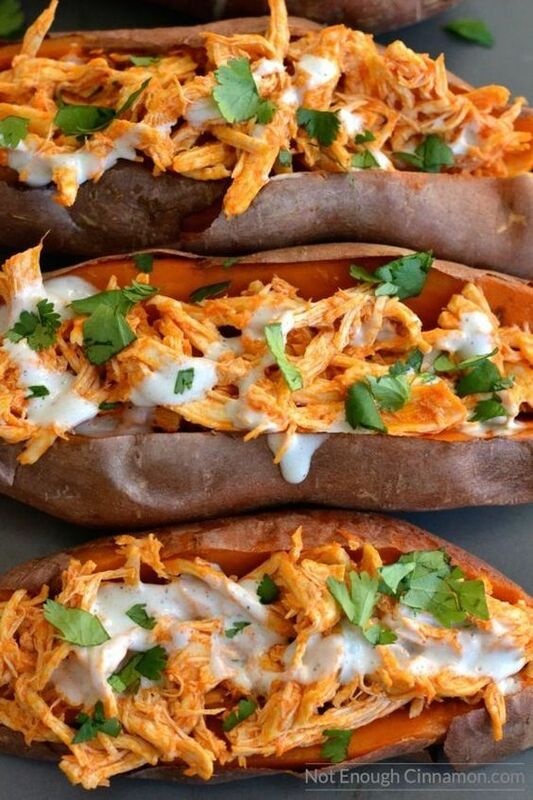 Baked sweet potatoes, with a crispy skin and soft flesh, stuffed with shredded chicken soaked in buffalo sauce and drizzled with blue cheese sauce… These skinny buffalo chicken stuffed sweet potatoes are not only extra delicious, they’re also very easy to make, good for you and less than 320 calories for a large serving! They are naturally gluten free, too. Preheat oven to 400F/200C. Line a large baking sheet with aluminium foil, place sweet potatoes on it and bake for 30 minutes or until flesh is very tender (test with a knife). Turn off the oven and keep the sweet potatoes inside to keep them warm. 0 Response to "Skinny Buffalo Chicken Stuffed Sweet Potatoes"